In 2005, Hurricane Rita struck Southeast Texas, severely damaging Mr. Brasher’s home. As a result of the difficulty he had in receiving compensation for his losses through his insurance company, he started helping other homeowners, churches, and businesses with their claims. He witnessed firsthand the struggle that homeowners have with insurance companies and decided that he wanted to stand up against the injustices he saw occurring. When Hurricane Rita damaged his home, Mr. Brasher was forced to personally deal with multiple adjusters, multiple different “representatives,” repeatedly having to start over with his insurance company, and even being told outright that he lacked coverage that he knew he had. As his frustration continued to grow, he realized that he was not the only one being treated like this by insurance companies. It was at this time that Mr. Brasher determined he needed to help others like him. He litigated over one hundred claims for policyholders following Hurricane Rita. Mr. Brasher continued his representation of policyholders for a few clients following Hurricane Humberto and, then, following Hurricane Ike, he represented several hundred more. From 2005 to the present time, he has handled close to 1,000 litigated claims on behalf of policy holders. Notwithstanding the number of cases handled, he prides himself on establishing personal relationships with his clients. After a hailstorm caused serious damage to their home, a family in Amarillo turned to Mr. Brasher for assistance when their claim was denied. After a weeklong trial, Mr. Brasher recovered $325,000. Mr. Brasher recovered $430,906.02 for commercial property owners in College Station against United Fire. The insurance company had refused to pay their claim based on a vacancy clause. Mr. Brasher represented the First Baptist Church of Vidor (First Baptist Church of Vidor v. Guideone Insurance Company) following Hurricane Rita and secured a $1.7 million dollar award for covered losses when their insurance company’s initial payment was $4,022.79. In Hurricane Humberto, he and his firm secured a $403,609.47 award for Long Furniture for damage to its warehouse. In that case, the insurance company had estimated the damages to be $253,422.09. Following Hurricane Ike, Mr. Brasher litigated approximately 400 claims. Included in that representation was the largest verdict in a residential case following a four week trial. In Latosha Lewis v. National Lloyds Ins. Co., Mr. Brasher won a record verdict of $858,000.00 for a claim that was denied following Hurricane Ike for her policy which was limited to $54,000.00. Included in the award was $300,000 in punitive damages for gross negligence, $350,000 in attorney fees, and the remainder for covered losses and insurance code violations. Mr. Brasher also had recoveries for similar sized policies. For a $77,000 policy, he recovered $450,000.00 and for another $54,000 policy he recovered $485,000.00. Mr. Brasher has represented a host of businesses, from restaurants, to strip malls, apartment complexes, to convenience stores. For one convenience store, he secured a $250,000 settlement for a claim after Hurricane Rita when the storeowner had been paid nothing. He was able to secure a $508,000 award followed by an additional settlement of $200,000 for fees and expenses for a string of convenience stores following Hurricane Ike when the storeowner’s claims had been grossly underpaid based on Hurricane Rita payments. While a bulk of his practice is devoted to policy holders against their insurance carrier, he still handles wrongful death, serious injury, and other cause worthy actions. In 2001, he recorded one of the largest retaliation verdicts under section 451 of the Texas Labor Code in Jimmy Couch v. Pro-Quip Corp. The verdict was for $852,000.00 for retaliating against Mr. Couch for filing a worker’s compensation claim. He has tried cases as far away as Pecos, Texas. In Edward Arabie v. Cactus Drilling, he won a $240,000.00 verdict for failure to provide a safe workplace for Mr. Arabie. He was co-counsel in a shareholder suit and successfully had a receiver replace a sitting CEO who was driving an oil and gas company into debt. The litigation resulted in a company-wide settlement was well as a buyout to a foreign oil company. *He has worked on and helped resolve class actions, shareholder disputes, as well as claims arising under the False Claims Act. Clint Brasher has been licensed to practice law since 1999. He attended The University of Texas School of Law, graduating in December 1998. In his early career, Mr. Brasher’s work was focused on injury trials, shareholder disputes, wrongful termination, and claims brought under the False Claims Act. In 2004, at the earliest possible date he could apply, Mr. Brasher applied for and was granted a Board Certification by the Texas Board of Legal Specialization in Personal Injury Trial Law. To be Board Certified, an attorney has to have practiced for at least 5 years, tried the minimum number of cases, be recommended by judges and fellow attorneys, and, once all of those conditions are met, pass a difficult exam. Following his Board Certification, he sat for the Bar exam in Louisiana and received a license there as well. 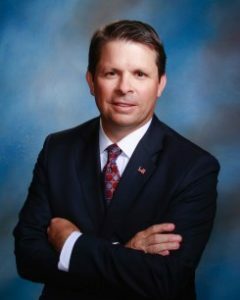 Mr. Brasher is currently in good standing in both Texas and Louisiana and is licensed to practice in all state courts in both states as well as the Western District of Louisiana and Eastern and Southern Districts of Texas (federal courts). 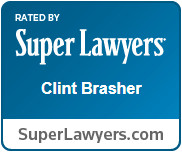 In 2005 and 2006, Mr. Brasher was recognized by his peers as a Super Lawyer ® Rising Star SM. He is also a member of the Million Dollar Advocates Forum® for his work obtaining millions in compensation and he is rated AV Preeminent® by Martindale Hubbell®. He is a member of the Texas Trial Lawyers Association and has been included in their list of Top 100 Trial. He is a current member of the State Bar of Texas, and the State Bar of Louisiana. Mr. Brasher was recently elected to be a director for the Jefferson County Bar Association. Clint was born in Beaumont, Texas. He is married to Wendy Wagenbach Brasher and they are the parents of five wonderful kids: Madison, Emma, Derek, Adam, and Zachary. In addition to practicing law, Mr. Brasher teaches Sunday school and coaches soccer. He currently holds a National Youth License awarded through U.S. Youth Soccer and a National D coaching license. He is a tennis player and enjoys sitting on his back porch watching and listening to birds with his wife. He is an avid reader with interest in history and fantasy.